Walking in Stilettos on Cobblestone Streets: What happens if you 409 all the spiders? My on-going battle with the spiders in my apt must have been succssful (largely due to the help of 409 spray). I haven't seen a spider in 1 week. 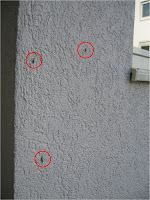 Instead, huge mosquito's now live outside my apt and keep trying to get in. To ensure that none get into my apt, I have to play elaborate games with them to shoo them away before I open my door. I also can't open any windows. Unfortunately, I don't seem to have the option to get rid of both. So now I need to decide what is worse - spiders or mosquitos? 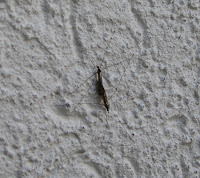 Pic2: the hug insects... They're like 2 inch in diameter. I like your 'recent visitors to blog' function. Need to add it to my blog. How do I do that? By the way, I know all about sharing your apartment with unwanted guests. In India, I had to contend with a mouse, mosquitos, and lizard (among other non-descript insects) in my apartment. The mouse and lizard were fine - the mosquitos were a problem.